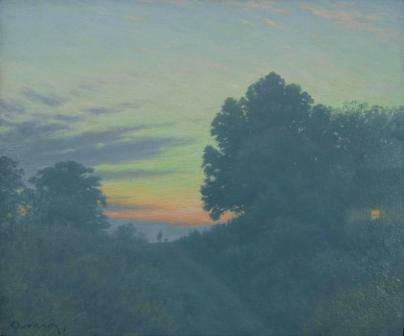 In ''Silent Lane'', Steven Outram paints the misty silhouette of trees with the backdrop of a still warm but slowly fading sunset glow. Soft grey and red tinged clouds cross the sky. A small figure of a man and a dog give us some sense of scale.